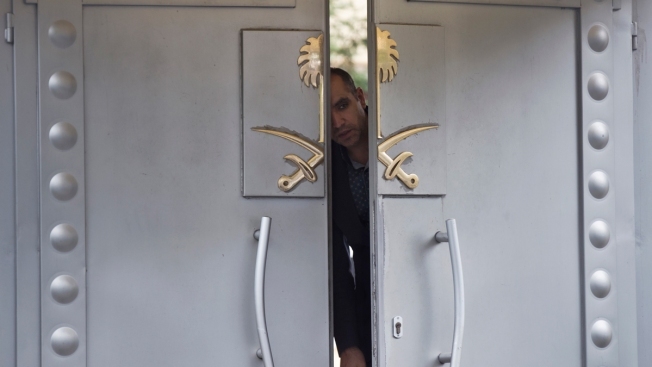 This Oct. 14, 2018, file photo shows security personnel looking out from the entrance of the Saudi Arabia's consulate in Istanbul. Top Saudi and Turkish prosecutors on Monday discussed the investigation into the killing of Saudi writer Jamal Khashoggi, a show of cooperation despite differences over which country should try 18 suspects who were detained in Saudi Arabia. Saudi Arabia's top prosecutor, Saud al-Mojeb, met Istanbul's chief public prosecutor, Irfan Fidan, for one hour and 15 minutes at the main courthouse in Turkey's biggest city, Turkey's state-run Anadolu news agency said. The two countries are running a joint investigation of the killing, though Turkey has been leaking information about the case to the media in an apparent effort to pressure its regional rival for full disclosure. Turkey is seeking the extradition of the Saudi suspects detained for the killing in the Saudi Consulate, which happened after Khashoggi entered the building on Oct. 2. Saudi Foreign Minister Adel al-Jubeir, however, says the kingdom will try the perpetrators and bring them to justice after the investigation is completed. Saudi officials characterize the killing as a rogue operation carried out by agents who exceeded their authority. Some of those implicated in the killing are close to Crown Prince Mohammed bin Salman, the kingdom's heir-apparent whose condemnation of the killing has failed to ease suspicions that he was involved. Khashoggi, a onetime Saudi insider and U.S. resident who lived in self-imposed exile for almost a year before his death, had written critically of the crown prince in columns for The Washington Post. Under mounting international pressure, Saudi Arabia has changed its narrative about Khashoggi's killing several times, recently acknowledging that Turkish evidence shows it was premeditated. Turkey alleges a 15-member hit squad was sent to Istanbul to kill the journalist. Turkish President Recep Tayyip Erdogan says his country will reveal more evidence about the killing but is not in any rush to do so. U.S. Defense Secretary Jim Mattis has said the killing undermines regional stability and has urged Saudi Arabia to conduct a full and complete investigation.